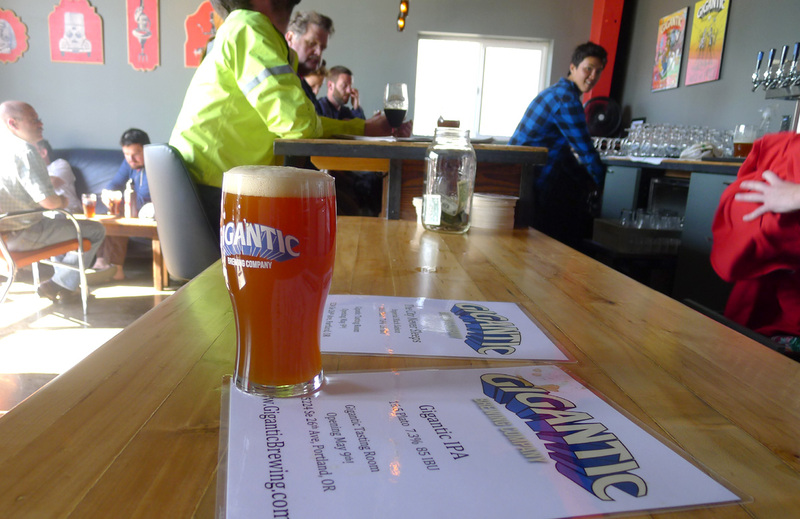 There was great anticipation in the days, weeks and months before the doors at Gigantic Brewing finally opened a few weeks back. That's largely because co-founders Van Havig and Ben Love both have extensive connections to the local beer community. If you aren't in the know, Havig was the head brewer at Rock Bottom Brewery (downtown) for 16 years before he left in a dispute over the direction there. Love worked with Christian Ettinger at Hopworks from the beginning there. If you consider the gestation period typically required to convert brewers to brewery owners in Portland, it’s pretty clear that Havig and Love were ready for their own gig. This business will do well. 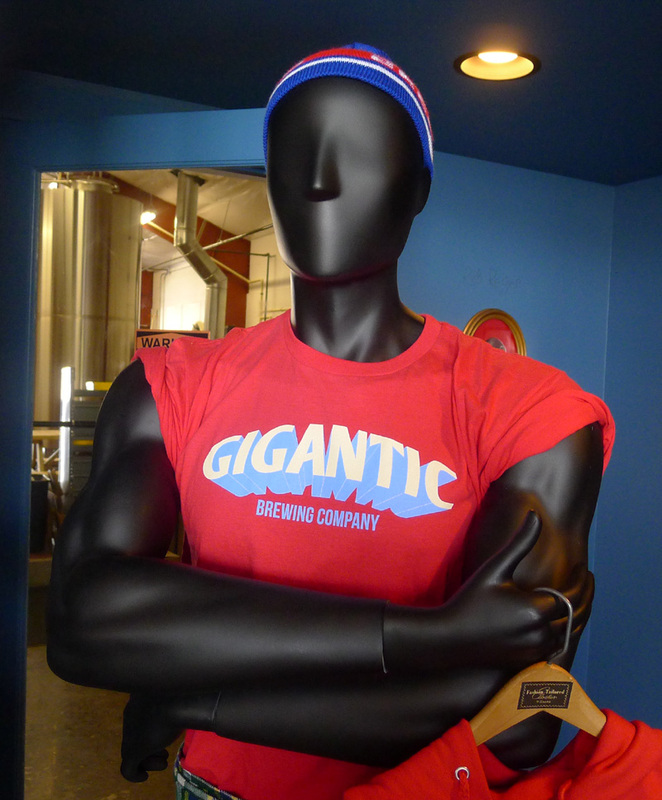 The brewery and tasting room is located in a good spot…a hop (haha) and a skip from the Reed College campus. That should provide a regular crowd of thirsty patrons to go with the folks that come here from around town. 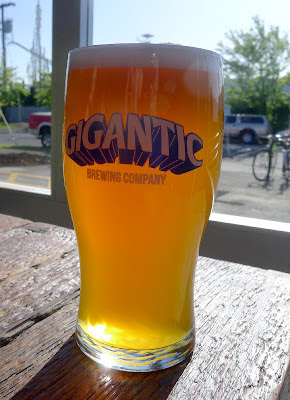 House IPA + Sunshine = Gigantic! During the recent grand opening, they featured five house beers and three guest taps. I suspect the guest taps will go away as they evolve. I want to mention the IPA, which I first tasted at the Oregon Garden Brewfest about a month ago. It reminds me of Boneyard RPM...lots of floral and citrus notes. Terrific! Havig and Love intend to maintain a rotating list of beers. They will reportedly have only a single year-round beer...I assume the IPA, which will sell well. This means they will be brewing a lot of specials and seasonals. That’s in keeping with the general Portland trend of increasingly eclectic beers. It’s worth mentioning there’s no food here. Nada. This is just a tasting room. They’re leaving a lot of money on the table by not offering food in this under-served part of town. But food obviously is not their thing. They intend to make it or not based on the quality of their beer. Those beers will be distributed to a variety of pubs and retail outlets via Maletis Distributing. However, the tasting rooming is more than worth a visit. It's small, interesting and comfortable. They now have tables outside, which wasn't the case initially because they were waiting on the appropriate city permit. If you're headed their way, check the website before you drive, bike or whatever. They're open five days a week, but hours are somewhat limited. Oh, they will evidently be open for Portland Timbers games, regardless of the day. Oh yes, you must get over there. Great spot. I'm not sure everyone agrees on Boneyard RPM. I like it a lot, but opinions differ. The Gigantic version has a little thicker spine, I think...wonderful stuff. If they still have the St. Tennenholz (5.7% ABV) when you stop by, do not fail to taste it. Truly fantastic...probably should have been mentioned above. Agreement, no. But I haven't encountered a beer with buzz like that one for years. I'll try all the beer!